Editor's note: French America Line is not currently sailing. The French America Line is a boutique American cruise line founded in 2015. It's based in New Orleans and headed by industry veterans Christopher Kyte, the former president of American Queen Steamboat Company and Tom Markwell, a former managing partner at Haimark. The company aims to bring European-style river cruising to the United States. The focus is on experiential travel that is refined but not stuffy or formal. The first ship from French America Line, Louisiane is designed with a more European style than other riverboats sailing in the U.S.
French America -- a new river cruise line sailing the waterways of the United States -- wants passengers to enjoy comfortable luxury, outfitting its ship with lush colors, furnishings and high-end fabrics and trims. Staterooms feature wood walls with upholstered panels to add softness and a Parisian feel; many will have regular or French balconies. Common spaces aren't common at all, with crown molding, high ceilings and crystal chandeliers. The main wrought-iron staircase is even highlighted in gold leaf. Seating areas feature curved sofas and upholstered chairs. Soft curtains draped around windows and doorways create a feeling of intimacy. The French America experience is centered on educating passengers about the culture and history of the ports they're visiting. Onboard educational presentations are given in the Great River Lounge, a multipurpose room with multiple LED screens in place to illustrate expert's talks. At least one included excursion will be available in every port, and passengers can pay extra for private tours or in-depth excursions such as a trip to Chef de Cuisine Regina Charboneau's hometown of Natchez, Mississippi, for a cooking lesson. The Paris-trained Charbonneau, author of Mississippi Current Cookbook: A Culinary Journey Down America's Greatest River," has created a menu focused on French and specialty dishes from the areas the Louisiane visits. There is also a healthy option menu with offerings of less than 400 calories. Besides excursions, fares will include a one-night stay at a hotel before the cruise; transfer to the vessel; unlimited wine, beer and spirits; and Wi-Fi. Bikes, helmets and maps will be available for complimentary use in port. The ship will also feature a full-service spa and two dining venues. As the Louisiane prepares for its first cruise in summer 2016, the French America Line said it expects its passengers will be affluent travelers aged 50+ with an interest in learning about the culture of the places they're visiting. They will appreciate the onboard lectures and other enrichment options, as well as the high-end amenities the line offers. About half of the passengers are expected to be from Europe and Australia, with the rest coming from the United States and other countries. The Louisiane, French America Line's first ship, was originally launched in 2000 as the Columbia Queen. It sailed on the Columbia, Snake and Willamette Rivers for the Delta Queen Line, Great American River Journeys and Majestic America before being sold to French America in 2015. 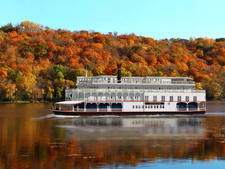 Under French America's ownership, the 218-foot riverboat underwent a multimillion dollar makeover with French touches. The ship can accommodate 150 passengers in 75 cabins. The Louisiane will have eight homeports, including Natchez, Memphis and Nashville, and will make calls at more than 30 ports. Besides sailing the lower and upper Mississippi and Ohio rivers, the vessel will sail less-traveled waterways such the Tennessee and Cumberland, the Red River, which is a Mississippi River tributary flowing from Louisiana to Texas, as well as the Intracoastal Waterway.